An item on the RTE News the other night, triggered a deluge of very happy childhood memories for me although the story itself was sad. It featured the little Waterford village of Passage East, on the River Suir and the herd of feral goats who live on the steep hill there. Local lore says that this herd of goats, one of the last herds of wild goats in Ireland, swam ashore from the Greek sailing ship over 200 years ago. They have lived on the hill ever since and are very much part of the village. They were on the news because some days ago 20 of the herd disappeared overnight, leaving just 8 goats behind. Local people are rightly angry and a reward has been offered for their safe return. However it is widely suspected that these goats were stolen to order and so it is unlikely that their safe return is, at this stage, still a possibility. Every year our family, like most at that time, holidayed in Ireland. We usually rented holiday houses in various locations around the country. One year we went to Passage East and loved it so much we went back the following year too. They were great holidays. I reckon I was about 10 or 11 years old. The first year we were there, my brothers and I spent hours sliding down the goat hill on flattened cardboard boxes. I don’t know how we didn’t sail right off and land in the road – but we didn’t. When we weren’t careering down the hill, we used to hang around on the little pier where the ferry across the river went from. Nowadays there is a small car ferry joining Waterford with the Wexford village of Ballyhack. Back in the 70s however the ferry was a small rowing boat with an outboard engine which was operated by an elderly man called Patsy. If our luck was in Patsy might only have one or two passengers and so he would take us with him for a free trip. 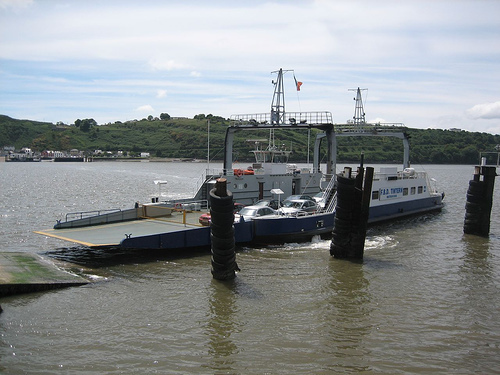 Best of all was when he would launch his little ferry just after a large ship had passed upstream (on its way to New Ross) and we would enjoy the rollercoaster like thrills of riding in her wake. Needless to say there wasn’t a life jacket in sight – and we generally didn’t ask permission from our parents to go out on the water either! In the evening we would again be down on the pier waiting for the fishing boats to come in. They fished for salmon and once the boxes of fish were unloaded, the fishermen would usually keep a fish or two for themselves. So we would be engaged to carry these large salmon in our arms up to the fishermen’s houses. We would come back to our holiday house shimmering with fish scales, stinking of salmon but with a 10p to spend in the one village shop. The innocence and the excitement. When we drove out of Passage East at the end of the second holiday I remember all the boys were waiting by the village sign to wave us off. I then had to suffer the entire journey back to Dublin being slagged by my very immature brothers about my ‘holiday romance’. I have a short and light article on the writing.ie website today. Entitled 'My Curtains' it recalls some of my dear mother's adventures in making my clothes when I was a child! It's one to read over your coffee... enjoy. Well, I have to say that Evans were very prompt in their reply to my sending them a link to my previous blog post BRITISH STORES RIPPING US OFF? I reproduce below the nice reply from Audrey (she doesn't sign her second name). Thank you for your email received 9 June 2011. I am sorry to note your disappointment with our pricing structure following your recent visit to one of our Republic of Ireland stores. Our Sterling and Euro prices are set in advance of the goods being delivered to our stores in the UK and Ireland. We appreciate that, depending on the current exchange rate, customers may be adversely affected at times, however it is not possible to amend our prices in line with fluctuations in exchange rates. If you would like, you can place an order through our website. We will charge you in Pounds Sterling and your card issuer will apply the relevant conversion rate. If there is anything further I can help with, please do not hesitate to contact me by replying to this email address. Mmmm - I don't think Audrey read the post... as it was a visit to the Evans Store on Oxford Street (London, UK) that got me very cross. The point I was trying to make was that how can Evans justify an item that costs €60 in London can cost €75 in Dublin? That is a huge differential and cannot be explained away by currency fluctuations. Over to you again Evans - why the difference? As for encouraging me to buy online - yep I know I have that option, but our economy is enough trouble without us by-passing shops here that employ Irish staff in order to buy online? Needless to say I am not satisfied with the response. However for my Irish readers - please watch what you are buying in British Stores here. I have a sneaking suspicion that Evans are not alone. And as Hazel posted in the comments to my previous post, Ireland may well be seen as Treasure Island by UK Stores operating here - and ripping us off! BRITISH STORES RIPPING US OFF? First of all, apologies for the gap in my blogging! I have had a very surreal two weeks with 2 trips to the UK in one week and my eldest daughter, Carla leaving for Australia this week. I have regained my energy and am working on putting my emotional self back together at the moment! Anyway – hence the silence. Said daughter, Carla is a travel agent and decided that we should have some quality mother and daughter bonding time before she emigrated and so booked us an overnight trip to London. We had a great two days – full of laughter, sore feet, a bit of shopping, nice food, some wine and Dirty Dancing. It was wonderful. While on the shopping part, I visited Evans on Oxford Street where, with Carla’s encouragement I purchased me a dress (I don’t generally do dresses – this was a major event). The price tag listed the UK sterling price as £49.00. As Evans also has shops here in Ireland it also listed the euro price of (wait for it) €75! Yes – that’s right €75! Anyway having decided to purchase I went to the till and paid with my Laser (debit) card. The assistant asked if I would like to pay in euro or sterling. “How much is it then in Euro?” I asked. €60 was the reply. Needless to say I paid in euro at the till. But it goes to prove (again – I know this is not new news) that we are being ripped off here in Ireland by British stores. How on earth can an extra €15 on the price of a garment be justified? I am sure that our neighbours in Northern Ireland pay the same price as in London. When I chatted about this with Carla she told me that some of her friends go into the British Stores and try on clothes for size. Then go home and buy them online as it’s cheaper! Madness – especially in the current economic climate when we need to protect Irish jobs. I will send Evans a link to this post and seek an explanation. I will let you know of the outcome!